Newest and coolest trend on the foody scene … FOOD TRUCKS! 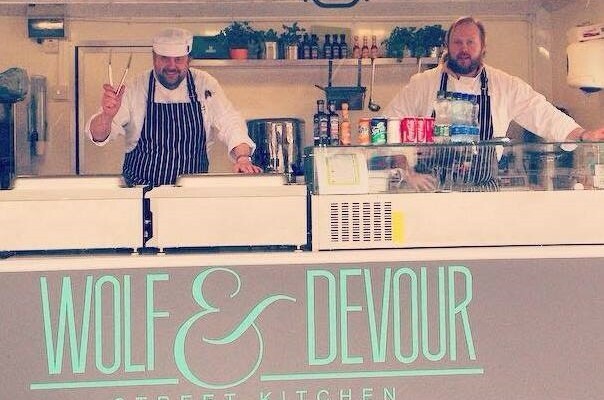 Wolf & Devour is Northern Ireland’s newest and most stylish ‘Street Food’ truck! Established in April 2015, this kitchen on wheels can cook up some of the most delicious dishes for you and your mates. Fresh of the griddle, their signature ‘Wolf’ Burger never fails to impress, nor does their ‘Steak Out’, Steak Sarnies or Steak Frites! Alternatively, their menu includes gourmet delights such as Pulled Pork Sliders, Mini Fish & Chips, a classic BLT, Rosemary & Parmesan Fries or, for those of you with a sweet tooth, their waffles and luxury hot chocolate are to die for! All produce is impeccably sourced from Northern Ireland’s best local suppliers. meanwhile their disposables come from their eco-friendly neighbours, Greenman Packaging in Bangor and are fully biodegradable. Cool, casual, and totally tasty, Wolf and Devour offers a quirky, memorable and an often budget-friendly way to eat at any event. Price Range: £4.00 – the sky’s the limit! Hire them to cater for your event, wherever it may be!